A PDF of this article, published in the October 16, 2015 issue of Executive Intelligence Review, is re-published here with permission. Oct. 11—The journey of Simon El’evich Shnoll—today a professor of physics at Moscow State University—started at the beginning of the atomic age in 1951, when he was employed to prepare radioactive solutions in a “branch of the Atomic Project,” the newly reorganized Department of Medical Radiology at the Central Institute for Physician Excellence in Moscow. On the side, at the end of the workday, he performed experiments in his specialty field, biochemistry. The adenosine triphosphate molecule (ATP) is widely used in the body to transport energy. ATP is broken down—releasing the energy needed for other specific biochemical reactions locally in parts of the body (such as muscles)—by several enzymes collectively called ATPases. He began with experiments measuring enzymatic (ATPase) activity—the use of ATP by the proteins of the actomyosin complex, a complex that controls muscle contraction—and noticed something strange. The reaction rate seemed to change dramatically over short periods of time. Having taken a measurement of reaction rates every 15 seconds, he found that the rate of reaction did not fluctuate about a particular average rate, but rather varied wildly, sometimes smoothing out and sometimes jumping by a factor of two. Original Caption: Figure 1-3. Illustration of “macroscopic fluctuations” reaction rates of ATP + creatine → creatine phosphate + ADP catalyzed by the enzyme creatine kinase. Experiment on May 30, 1978. The x-axis displays the time in minutes, and the y-axis the reaction rate in conventional units. Original Caption: Figure 1-2. 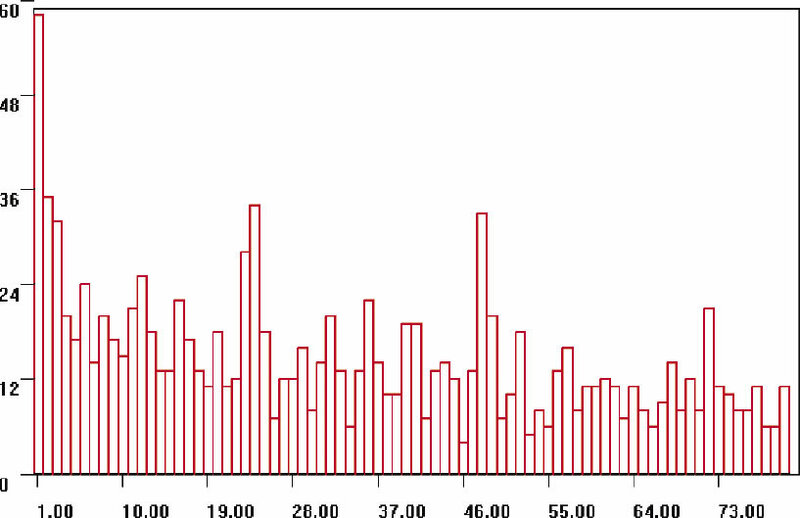 The histogram distribution of realized values of the experiment depicted in Fig. 1-1 [omitted], conducted on October 5, 1957. 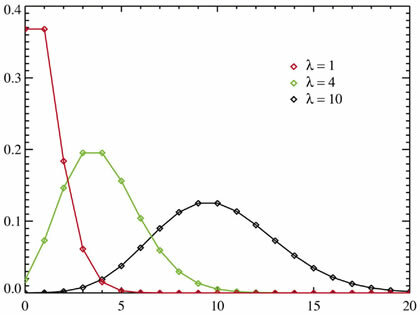 Figure 2 shows a bar graph (histogram) of these rates. It tabulates the number of times each reaction rate occurred. As can be seen in the graph, the reaction rate of 360 units of ATPase activity per unit of time occurred most frequently, while the rate of 240 units was never registered. http://cnx.org/content/col11496/1.6/, June 19, 2013, unit 2-6-4. 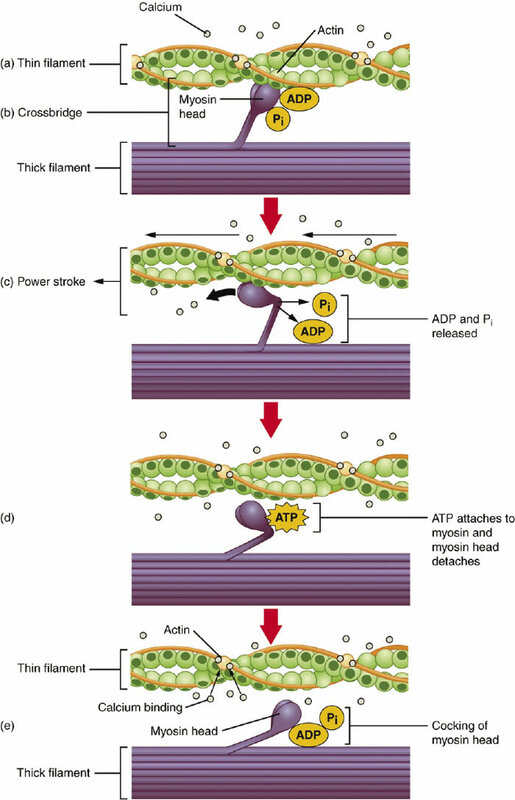 States of conformation in the actin myosin complex in skeletal muscle contraction. ADP is adenosine diphosphate; Pi is inorganic phosphate. In an attempt to narrow down possible causes and factors of influence, Shnoll took measurements from various parts of the volume. He found the same changes in reaction rate. He even took a common solution and poured it into several vials and measured those at the same time. The conformation changes were still synchronized. That is, though the rates continued to fluctuate, seemingly erratically, those fluctuations occurred at the same time for each separate sample. He tested this repeatedly, spending years trying to detect all possible errors: fluctuations in mechanics, temperature, pressure, and so on. Nothing turned up. He had a hypothesis: Perhaps it was this synchronization that allows rhythmic patterns in muscle contraction like the wing motion of insects. It was soon disproved, however, when Elizaveta Pavlovna Chetverikova discovered the same fluctuations in an enzyme she was working with, creatine kinase, not a fibril, but a compact globular protein, not related to muscle contraction. Again the reaction rates fluctuated, and they fluctuated synchronously among her samples as well as with his ATPase reactions. Shnoll and Chetverikova then tried every protein they could get their hands on: creatine kinase, pyruvate kinase, alkaline phosphatase, lactic dehydrogenase, acetylcholinesterase, and tripsin. All showed the same synchronicity. Could it be some fundamental property of biotic processes? In order to make sure that what he was seeing was indeed an enzymatic reaction, and not due to some merely chemical property during the reaction, he performed what he thought would be a control experiment. He measured the reaction rate of acetic acid with dichrolophenolindophenol (DCPIP, a blue dye), a purely chemical reaction. The reaction turns the solution from blue to clear, making the rate of reaction very easy to track and making detection easy to automate. 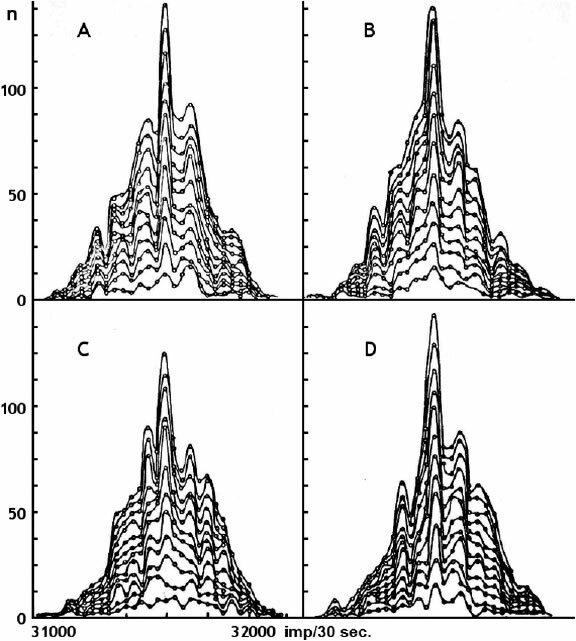 From these experiments, Shnoll found that although the amplitude of changes in reaction rate was lower, the shape of the histograms could not be distinguished from that of the enzyme reactions. This meant that either (1) a chemical reaction was influencing the enzyme reactions, but enzymes are just more sensitive to these changes, or (2) the chemical reaction was separately undergoing the same fluctuations of rates; that is, the histograms were the same shape, although the amplitude of variation in rates (Figure 1) is process dependent. Shnoll looked for external effects that could impact all reactions. This took many years. He and his collaborators searched for temperature, pressure, pH, mechanical, and several other possible effects. After eliminating these mechanical, thermodynamic, and chemical causes, he found that magnetic and electromagnetic fields influenced the amplitudes of both protein (e.g., enzyme) and chemical reactions. 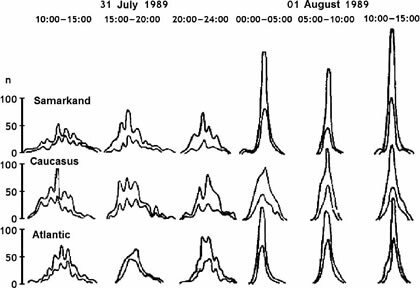 When 25 years of data were compared to solar activity, the amplitude of scattering (the range of variation of rates) was directly correlated with the rate of change of solar activity, as measured by Wolf number (also known as the international sunspot number). 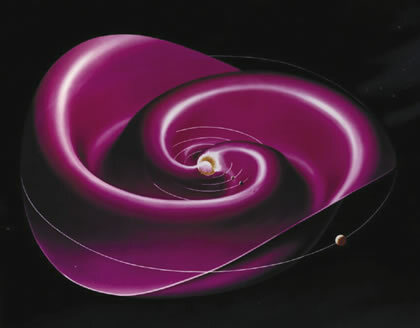 Shown here is the heliospheric current sheet which separates positive and negative sides of the the interplanetary magnetic field. Since it is not flat, the Earth crosses from positive to negative sides of the field many times a year. 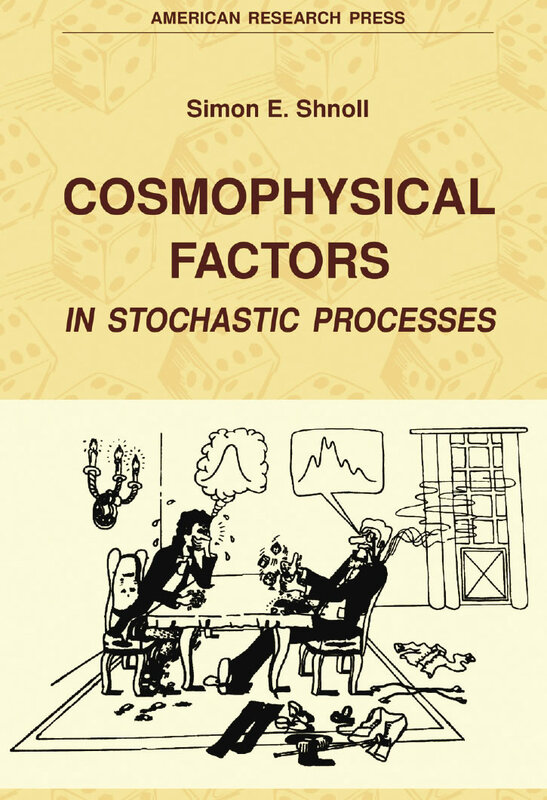 Poisson distributions for a supposedly ideal stochastic process. Because the process being studied is truly random, the curves become increasingly smooth as the number of measurements increases. The x-axis shows the numbers of occurrences that can happen in the given unit of time; the y-axis shows the probability (frequency) of the different numbers of occurrences happening. It was clear that changes in amplitude of variation could be influenced by many factors, however the cause of the similarity of histogram shape was still not clear. To investigate the shape of the histograms, Shnoll first tried to find a completely random process to use as a control, as calibration. Radioactive decay from one nuclear species to another, which he measured for 10 years as a doctoral student, is accepted as a completely random process in the small. But it has been a puzzle since its discovery in 1896 by Henri Becquerel, for many reasons. One is that it is both very constant and yet very erratic. Each isotope has a distinct, overall decay rate, its half-life, or the time it takes for half of the sample to decay. This rate is immutable. The only way to change it, besides dramatically changing its space-time, is by transforming it into something else, another isotope, which has a different unique half-life. 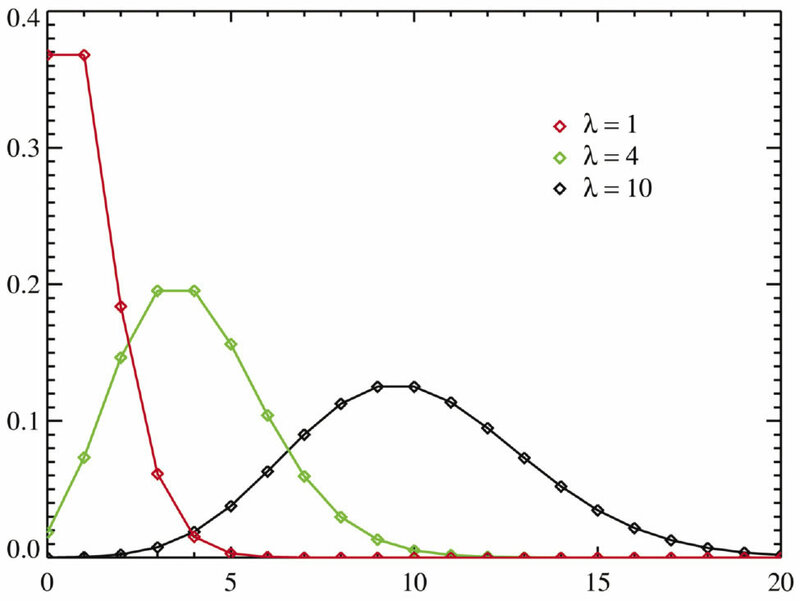 The histogram of a truly stochastic process is a Poisson distribution. (Figure 5) The more measurements in the experiment,. the smoother the curve becomes. Figure 5-17. 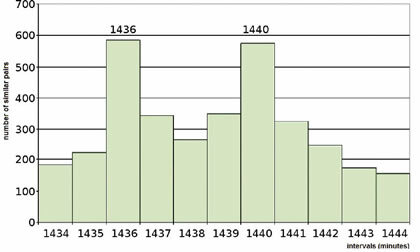 The “layered” histograms constructed from the results of measurements of radioactivity of Fe-55 on 18-22 February 1982. “Layer lines” are drawn after every set of 100 measurements have been added without any shifting or smoothing. On the x-axis, radioactivity [in imp/30 seconds] is shown and the y-axis shows the number of the measurements of the corresponding value interval of radioactivity. Shnoll and his staff ran parallel, simultaneous measurements of carbon-14 radioactive decay in Moscow, and of the creatine kinase (enzyme) reaction in Pushchino, more than 60 miles south of Moscow, and found two astonishing results. First, the histogram of radioactive decay rates was just as differentiated, that is, unsmooth, as that for the enzyme and chemical reaction rates. Second, the two simultaneous histograms were similar. Though Shnoll did not find the ultimate random process he was looking for in radioactive decay, he did find a great medium for his study. Radioactive decay, especially alpha decay (the emission of a helium nucleus of two protons and two neutrons), is practically independent of incidental factors. Experimenters have tried since its discovery to change its half-life, its macroscopic rate of decay, by subjecting radioactive samples to extremely high temperatures, pressures, and fields, to no avail. Original Caption: Figure 5-7. Simultaneous changes in histogram shapes constructed from measurements of acetic acid + dichlorophenolindophenol reaction rates at different geographical locations (all around [42 degrees North Latitude]): in Samarkand, in the North Caucasus (the Art. Sernovodsky), and on a ship on the Atlantic Ocean, in the night of July 31 to August 1, 1981. What Shnoll observed did not contradict the constant nature of a nucleus’s half-life. What he did see, however, is that the supposedly random, microscopic changes had a structure, and that structure was akin to that observed in so many other processes. Unlike enzymatic activity or chemical reactions, however, radioactive decay measurements are easily automated, need much less preparation, can be left alone for extended periods of time, and can be measured with high time resolution. Experiments were so easily automated that a portable version of the whole experiment was put on ships sailing to the Arctic and Antarctic, enabling the first synchronous experiments comparing results from widely separated geographical locations. Another important advantage of radioactive decay experiments is that alpha decay has a direction, and therefore spatial effects can be investigated. By placing radioactivity and chemical experiments on a ship traveling to the Indian Ocean, Shnoll’s team found that histograms recorded at Pushchino and near Madagascar—6000 miles away but at nearly the same longitude—were synchronized. 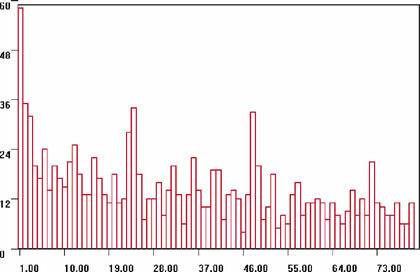 Results from radioactivity measurements in Lindau, Germany, however, showed histograms that were similar those at Pushchino, but offset by one hour, exactly corresponding to the difference in longitude between the two places. There seemed to some dependence on local time. On the other hand, expeditions into the Pacific Ocean revealed another synchronicity that did not depend as much on local time and seemed to observe “absolute time” or a global time: that is, histograms were similar simultaneously, without time zone offset. Figure 7 shows another finding of absolutely synchronous changes in three widely separated locations. 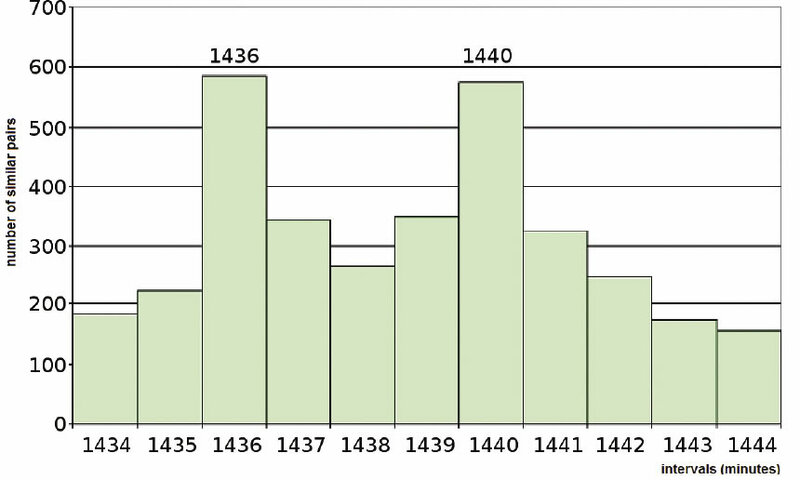 Interval charts like this one disclose the intervals at which histograms are similar. For example, if every histogram were similar to one 24 hours from it, no matter what time it is, then there would only be a bar above 24, 48, and 72 hours. 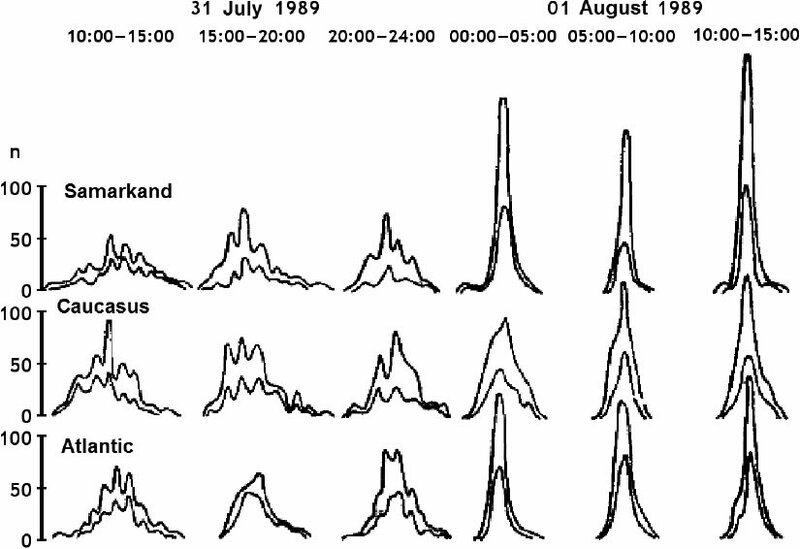 This chart is Figure 5-4 in Shnoll 2012, which shows results of comparison of one-hour histograms constructed from the results of Pu-239 alpha-activity measurements on May 18, 1998 in Pushchino. While comparing histograms, Shnoll and his team also noticed that histograms that were one day apart were similar. In other words, a histogram may be unlike another produced from data taken minutes later, yet be strikingly similar to one taken 24 hours later. 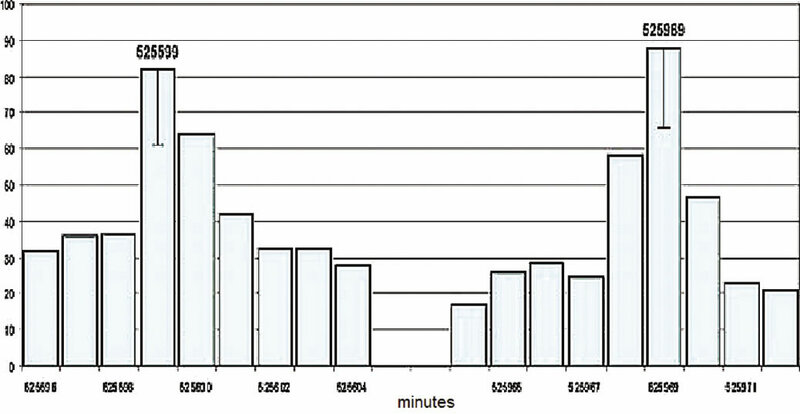 From comparing the time intervals at which histograms were similar, they made interval charts, such as Figure 8. From these time interval charts, many unexpected relationships were revealed. Schnoll took up a suggestion that he look for similarities using the sidereal (stellar) day rather than the solar day. They differ by 4 minutes. In solar time, the moment of sunrise tomorrow is determined by a combination of the Earth’s rotation on its axis and its travel along its orbit around the Sun. But sidereal time is independent of Earth’s travel along its solar orbit. Original caption: Figure 6-4. We observed two separate periods from measurements of Pu-239 alpha activity with detectors located in the plane parallel to the plane of the Celestial equator: the first equals one sidereal day (1,436 minutes) and the second equals one solar day (1,440 minutes). 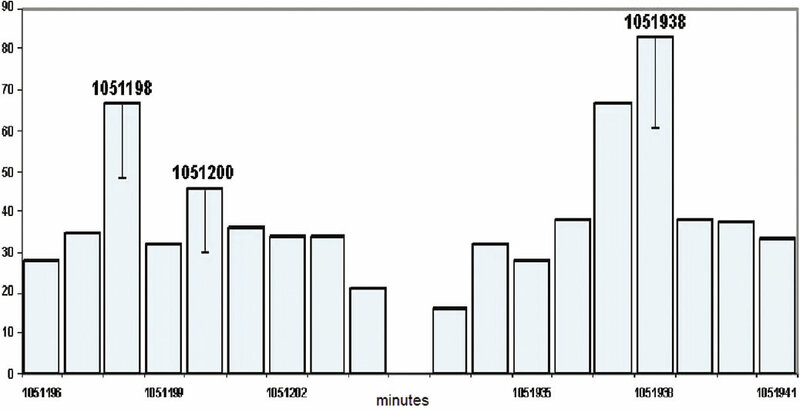 Shnoll refined his histogram intervals to minutes rather than hours, as shown in Figure 9, and compared them (he took one-second counts of decay, and made histograms of 60 different counts, amounting to one minute). When he did this, his 24-hour peak clearly separated into two peaks: one at 24 hours (1440 minutes) and one four minutes earlier (1436 minutes), exactly corresponding to the time it takes any particular place on Earth to come back to the same star (or seen inversely, for a star to come back to the same place in the sky). Why would radioactive decay, seemingly unaffected by many extremes, be concerned about the fixed stars so far away? Early in his researches, Shnoll had noticed similarities in histograms of reactions of acetic acid and DCPIP one year apart, and had begun taking measurements at the same time every year. He came back to these experiments and performed them more precisely, using plutonium-239 alpha decay. Again he found that the year split into two types of years, as shown in Figure 10. Original Caption: Figure 10-3. Histograms reoccur with a year period that includes two main periods, the calendar, equal to 525,599 and 525,600 minutes, and the sidereal, equal to 525,969 minutes, period; the accuracy of histograms is one minute. Measurements of Pu-239 alpha-activity on November 24, 2001 and November 24, 2002. 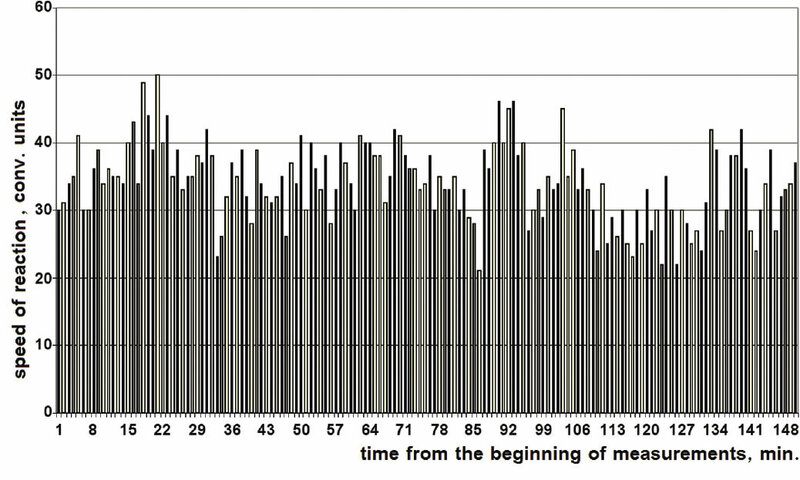 Comparison of histograms over two years shows the sidereal year vs. the solar year (365 days × 2 = 1051200 minutes) drifting by a quarter of a day each year, amounting to half a day over two years, along with another period which lags behind the calendar year by one minute each year, building to two minutes over two years (shown here as 1051198 minutes). Since this cycle could not be explained by cycles within the the Solar System, Shnoll hypothesized that it may be caused by motion of the Solar System with respect to something external to it. Again, why would decay rates or chemical reactions care about their orientation to fixed stars? Or even the Sun? Also, what would be common to all the different types of processes tested? As mentioned, alpha decay also has the advantage of being oriented in space. The helium nucleus is not always thrown off in the same direction. In an extensive series of experiments, Shnoll and his team used collimators (directional detectors), to look at the changes in decay rate in various directions—east, west, continually toward the Sun, and toward Polaris, the star toward which Earth’s axis is currently pointing. From these experiments, he was able to reveal a clear anisotropy (non-homogeneity) in space. That is, direction matters. For example, certain astronomical cycles would be revealed in one direction of decay but not another. The work of Simon Shnoll and his collaborators opens up many new domains of research. The few answers they have provided only serve to stir up more questions by orders of magnitude. First, there are the threads of research Shnoll clearly indicates would be important, but for which he has not had enough hands to continue. These include the experiments with proteins and their “macroscopic conformations.” What could these experiments tell us about proteins and life? Or about how the shape of space-time is reflected in other or larger life processes? Experiments at the north and south poles, testing for effects of the solar day as compared to the sidereal day, and other effects such as the anisotropy of space, remain to be done. Other avenues more broadly include ways to probe the shape of space-time. What features are shared by every process? Conversely, what features are uniquely expressed? Several experiments in detecting particular directions of alpha decay prove that directions in space are not equal. Perhaps this anisotropy is due to the motion of the Earth, the Solar System, or even the Galaxy. This could be tested in a manner similar to other experiments which Shnoll performed involving collimators. Perhaps such experiments will show that anisotropy of space is not due to motion at all. Perhaps most exciting is a sense of foray into a new physics. Shnoll had a hypothesis that perhaps gravity was at least one of the causes of variation, but experiments during times of high tides produced negative results. Hypotheses of neutrino fluxes as a cause seem to conflict with the definition of the particle as a weakly interacting one. Other hypotheses of concentrations of lepton gases also did not hold. Perhaps the effects of an entirely new, unknown principle are being detected in these experiments in that these factors do not influence the histograms, even though the histograms are changing. It may turn out that there is no simple mechanical cause, but only an overall effect of the change of space-time, as Shnoll suggests. Can these investigations of space-time be used to probe the structure of the nucleus? Perhaps, contrary to a reductionist point of view, the very small is made of the very large. Vladimir Vernadsky’s 1930 discussion of the study of life phenomena and the new physics also resonates here.3 In this paper, Vernadsky points out two gaping holes in scientific research: (1) universal principles which express themselves most distinctly in life and cognition, and (2) inherent and increasing dissymmetry of living matter. How does the structure of space-time express itself in cognition? Can we change this structure? Life does exist in the universe. It is not an anomaly. Nor is cognition. In fact, it is these phenomena which may tell us more about the laws of the universe, since they manifest laws unexpressed in the abiotic. Can Shnoll’s investigation then be reversed to ask, What then is unique to the space-time of life and of cognition? Though many questions remain unanswered, one thing is certain—there is no validity in asserting that any terrestrial process is closed, that it can be fully accounted for by terrestrial laws alone. 1. This randomness was used in the famous Schrödinger’s Cat problem, and has even been suggested to be used as a random number generator. 3. Vladimir I. Vernadsky, 1930. The Study of Life and the New Physics. What Is a Galactic Science Driver? Economists Who Were Usually Stupid by Lyndon H. LaRouche, Jr.